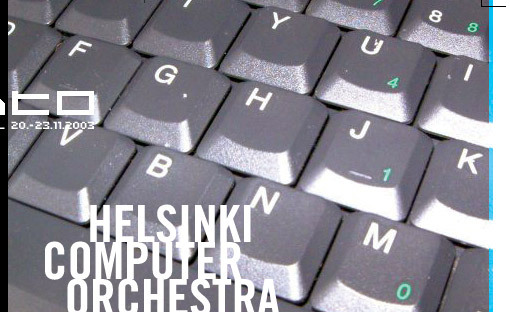 The Helsinki Computer Orchestra is comprised of a rather heterogeneous group of experimental electronic musicians, free improvisers, and noise musicians. Their instruments, too, vary from clumsy 80's game consoles to the aerodynamically designed powerbooks of the new millennium. At the orchestra's debut concert in March 2003 the conductor's duties were performed by Erkki Pirtola, and the orchestra played excerpts from two classics of 60's indeterministic avant-garde music, Prose Collection by Christian Wolff, and Treatise by Cornelius Cardew. Treatise uses graphic notation, and Prose Collection is a prose composition – most members in the orchestra have never worked with traditional notation. At Avanto, though, they will boldly take a step towards Academia. After witnessing the orchestra's debut concert, the Japanese-born contemporary composer Shinji Kanki, a veteran of the computer music studio of the Sibelius Academy, proposed to compose a new piece for their Avanto performance. Kanki's PCM 0355+53 can be approached with the concept of music as a language: what happens when a group of some twenty members, each playing in their own "language", start reading a score written in languages foreign to them? As source material for the score Kanki has used text in Morse code, EEG readings, dolphin sounds, and chance determined patterns – all these messages can be heard simultaneously in PCM 0355+35. At the Avanto concert The Helsinki Computer Orchestra will feature Samuli Alapuranen, Cumhur Erkut, Enrico Glerean, Sami Järvinen, Mikko Hynninen, Satu Karhumaa, Ilkka Klang, Tommi Lehtovirta, Heikki Lintula, Lauri Luhta, Emi Maeda, Sami Pekkola, Olli Pelkonen, Pilvari Pirtola, Samuli Salonen, Niko Sirkiä, Ibrahim Terzic, Jukka Vallisto, Juha Vehviläinen, Antoine Verhaverbeke and the orchestra's founder Tommi Keränen. The performance will be conducted by Shinji Kanki, who will also play the short wave radio. Helsinki Computer Orchestra will perform the Shinji Kanki composition PCM 0355+53 at the Avanto Club in Gloria on Friday, November 21st.